Spring is a time to bring scythe blades out of hibernation. Time to check that the oil we coated the steel with when we put them into storage in the Autumn is still protecting them (of course we all did this). 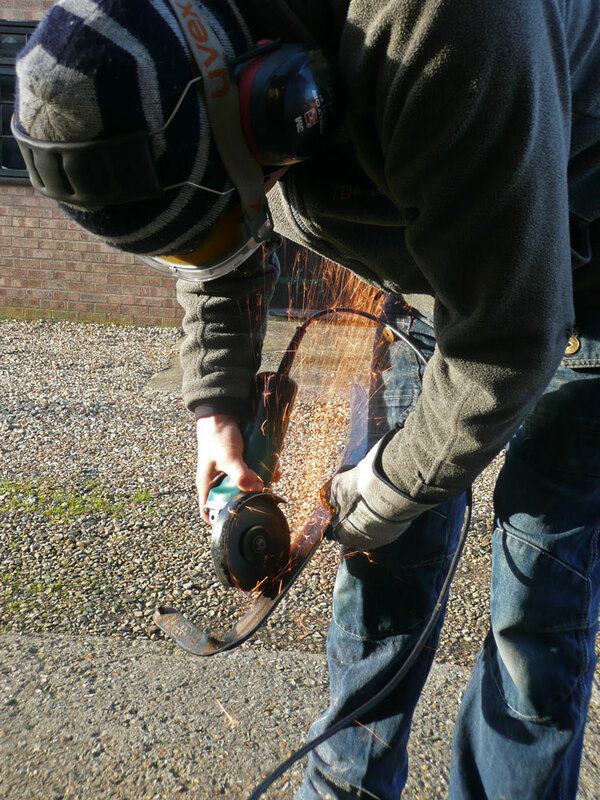 Time to re-clean our blades and check for any damage that needs repairing and peen to restore a perfect edge; all ready for action when the grass starts growing ( parts of my lawn is needing a cut already from winter growth). 2014 I have to confess was not a good year for me and scythe blades. I have had 8 years scything without serious incident until last summer at the Yorkshire sculpture Park when I struck an ugly lump of concrete just protruding above ground at blade height. I was trimming tough weeds and brambles on a rough made up bank around a David Nash Sculpture. I had checked the ground ahead and used a ditch blade, but I did not spot the concrete and the Styrias’ reinforced blade tip passed over it so that the heel caught the obstruction – oouch! This “nick” would need more than a bit of filing and peening! 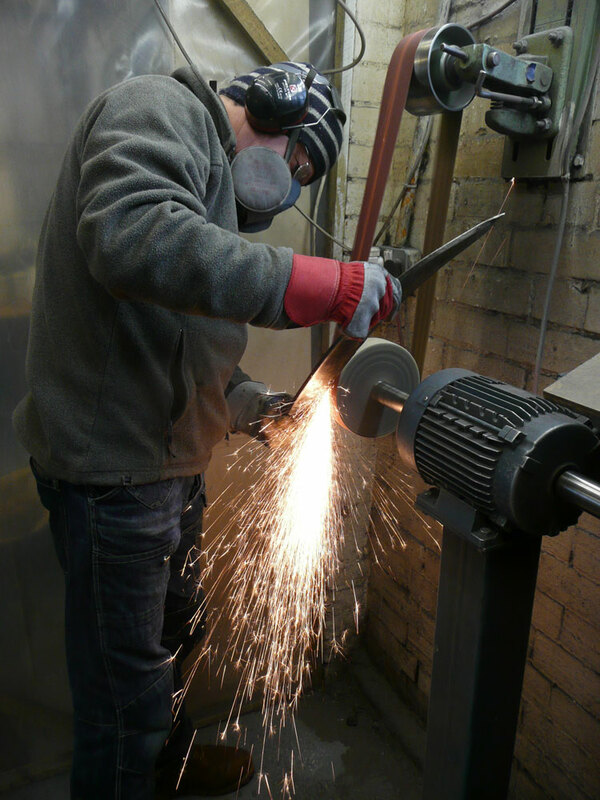 The blade steel was too hard to cut easily with tools in my own shed so I sought help from my cousin Will and his armourers workshop. 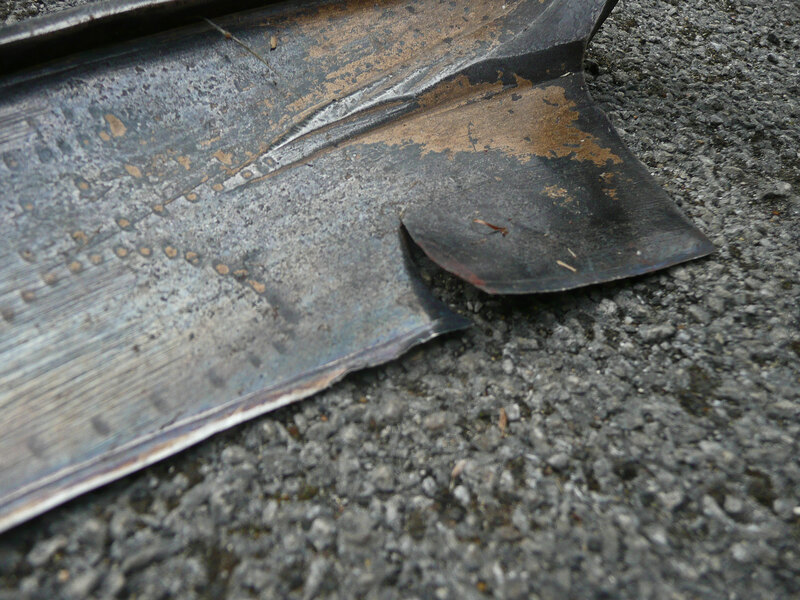 Cutting back to lose the damaged section created a new curved blade profile. 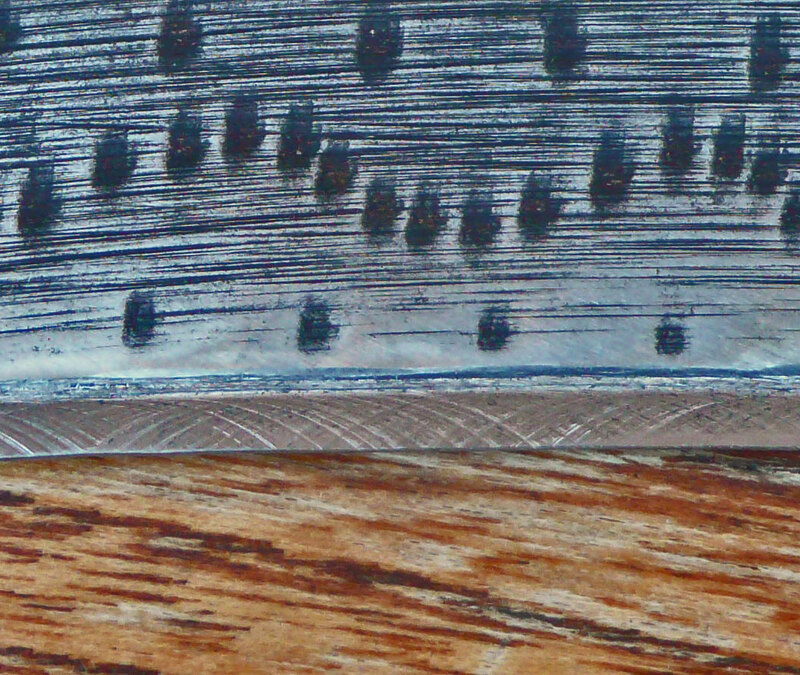 It also left me with a mega peening challenge to try to peen from 0.9mm full thickness metal back to a restored bevel and edge. I decided to use my peening jig initially to speed up the process. I worked along the edge with multiple passes with the two dies. I lost count of the number of passes: 15 -20 at least. I was pretty pleased with the jig results (as above). I then edge peened freehand a few times and honed. The blade cuts well again now. 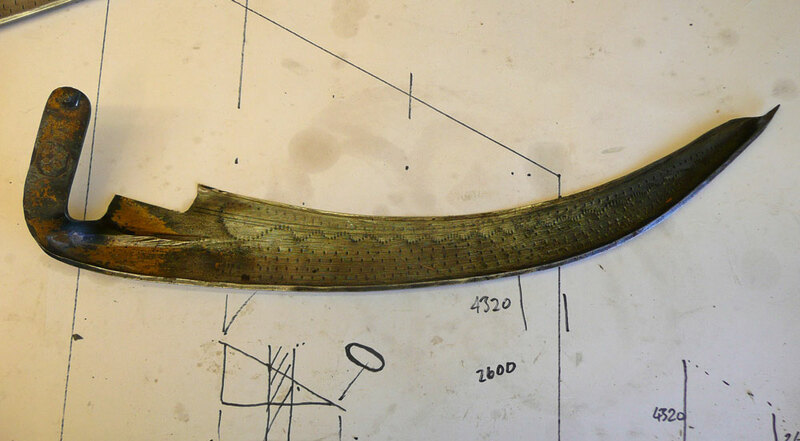 With the heel reduced and the radius of the edge altered the hafting position of the tang has moved. The action feels different to a complete ditch blade; more slicing throughout the stroke than before, which feels quite good for tight radius trimming work. This annual spring Peening day is a prompt for SABI members to renew their relationship with their scythes and mowing. This is an ‘everywhere event’ which takes place each year over the first weekend in April. The idea is to encourage scythesfolk to recover their blades from storage and to clean peen and sharpen their scythes in enthusiastic readiness for the coming mowing season. Lawns should be in full growth by this time and lush meadows will benefit from a light topping: both ideal for setting up and testing scythes. 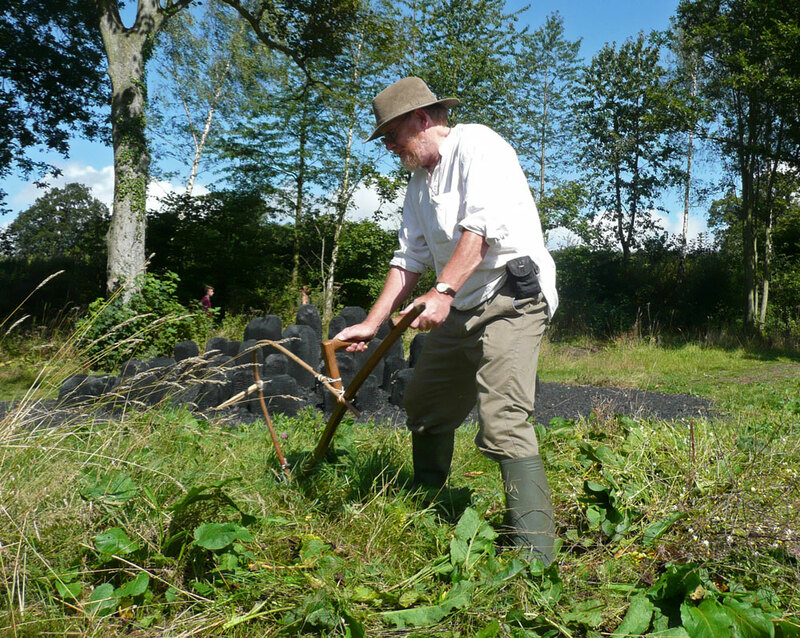 As part of this I am planning a Scything refresher, peen and set up session on the Saturday 4th on my home meadow and Lawn in Norfolk PE34 4PL. Anyone is welcome to come along. I will be on hand throughout the day to give free advice on mowing,peening or set up to anyone who needs a refresher to set them and their scythe up for the summer. see email and facebook notices for updates and contact details. This entry was posted in Sharpening & peening. Bookmark the permalink.